Duck & Foam Faux Pas! I love to cook for my friends, sometimes it’s a casual affair, a Sunday night ‘family meal’, and at other times it’s a planned event which is more involved, when the table is set just so and a special bottle or two are retrieved from the cellar. I like to plan my meals in the knowledge of what my friends will enjoy, whether that is vegetarian, seafood or as it was this time, duck. I can’t go past duck when it’s on a menu, so it was a great opportunity to cook it when A-L and I finally aligned our calendars for a mid-winter meal at our place, as she and her lovely husband also have a taste for this delicious bird. A-L and DBN are real gourmands and excellent hosts. Over the many years of our friendship I have enjoyed some wonderful meals at their home, always matched with superb wines and lots of laughter. Having these two special friends over always makes me want to extend myself, and as we are always so relaxed together, I can do so knowing any minor food faux pas (‘False step’ in French) will be forgiven. There were a few ‘false steps’ and they were forgiven! The main event was planned way back when we first set the date, duck confit, prepared several weeks earlier and resting in its bed of solidified duck fat for the night of our dinner. I served the duck with the classical pairing of braised puy lentils, French beans with garlic and carrots with cream and herbs. I also added a tiny amount of parsley puree sauce. All sounds pretty good, and it was, but the glitch was the duck, was unfortunately not crisp….faux pas!!. Next time I won’t rely on the oven to do the crisping magic, it will be straight into a hot fry pan, skin side down, using some of the fat the duck rested in to do its work. Not so crispy duck confit with braised lentils herbed carrots & garlic beans. 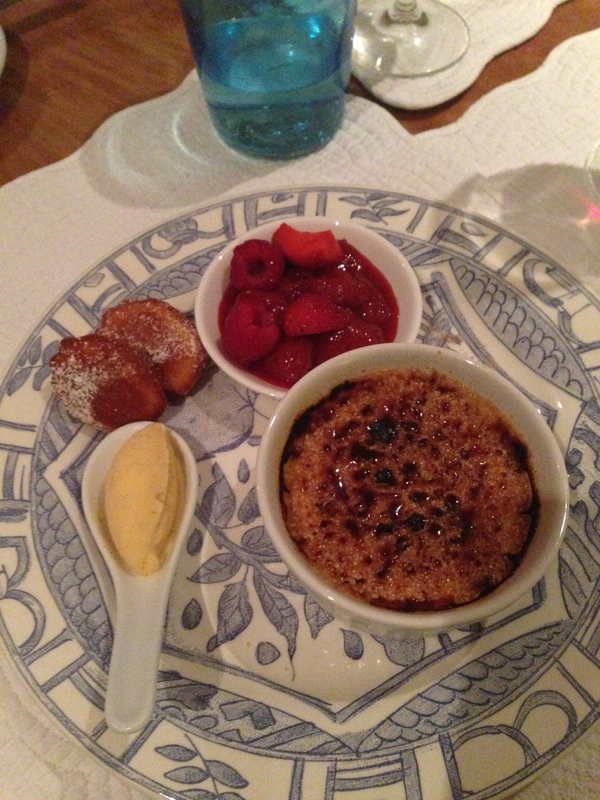 Continuing on with the French theme …yes I know…predictable….desert was crème brulee, berry compote, home-made vanilla bean ice cream and madeleines (faux pas free). Creme Brulee, with vanilla ice cream, berry compote & madeleines. It was a fun evening with wonderful friends & some good lessons were learned. Place half the strawberries and raspberries in a pot and add the sugar, water and balsamic vinegar and cook over a low heat until syrupy and the fruit is softened but not totally collapsed. Once cooled add to the reserved uncooked fruit. 1 Response to Duck & Foam Faux Pas!